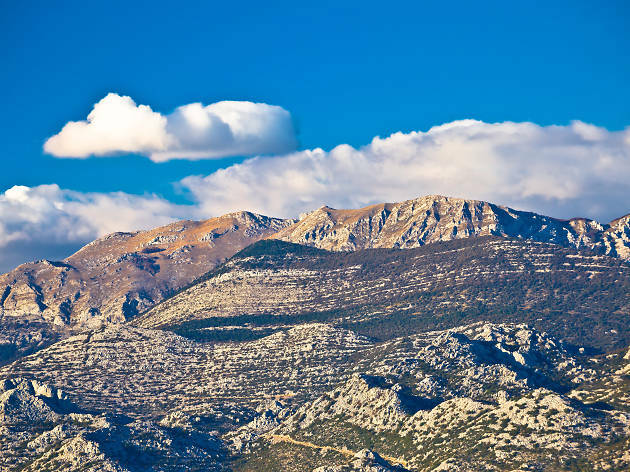 Like most national parks in Croatia, the Northern Velebit is teeming with spectacular wildlife. Though Croatia's coastline is its main draw, you really need to turn inland to experience the Croatian outdoors at its most dramatic. The highland ridges that run parallel to the coast offer some of the best-preserved natural wilderness in south-eastern Europe; and the Northern Velebit is among the wildest of the lot. A protected area since 1999, it is one of Croatia’s newest national parks, and serves as starting point of the Premužić Trail, the most scenic hike in the country. Running along the landward side of the Kvarner Gulf, the Velebit mountain chain is one of coastal Croatia’s defining features, stretching for almost 150km from north to south. Viewed from the coast, the Velebit comes across as a forbidding and inhospitable wall of jagged grey peaks. On closer inspection they reveal a staggering diversity of landscape, with dense forests and lush highland pastures sheltering among the deep folds of the mountain. Most travellers limit themselves to an admiring glimpse of the Velebit as they speed past it in their beach-bound cars and buses – which is probably no bad thing for the bears, wolves and lynx who make the mountain their home. Those tourists who do take time to pause here tend to gravitate towards the Velebit chain’s southern end, where the Paklenica National Park embraces a pair of dramatic, cliff-framed mountain valleys. The Northern Velebit National Park (053 665 380, www.np-sjeverni-velebit.hr), situated just inland from the Kvarner-Gulf coastal town of Senj, lies a fair climb above the main coastal road and is much less visited as a result. The park centres on the smoothly rounded peak of Veliki Zavižan (1,676m), where the Veliki Zavižan meteorological station also serves as an all-year mountain hut – beyond here tourist facilities are at a minimum and you are pretty much on your own. Maybe it’s because the Northern Velebit has remained relatively immune from the coach-tripping tourist industry that it has come to occupy such a significant position in the Croatian imagination. It is here that jaded Zagreb folk run away to when they want a life-changing encounter with nature. The region’s reputation as nature-trekker’s Holy Grail was enhanced by the appearance of ‘Priručnik za hodače’ (Walkers’ Handbook), by leading contemporary novelist Edo Popović, a meditative travelogue published in 2010 that had many of its readers rushing to the nearest sports shop in search of a pair of hiking boots. Rather than waiting for an English-language version of Popović’s exhilarating mountain-man prose to arrive in a bookshop near you, you’d be best advised to head out and experience the mountain at first hand. The best way to get to the Northern Velebit National Park from the Adriatic coast is via the steeply ascending road from Sveti Juraj near Senj, its succession of hairpin bends rising through scrub-covered countryside. Despite a scattering of tumbledown villages and hamlets it’s desolate terrain, and it’s something of a surprise to arrive at a neat-looking kiosk at Babić Siča, a few kilometres below Zavižan, where a man in national park uniform sells tickets for 45kn each. The road ends at a rather plain-looking car park just below the peaks of Vošak and Veliki Zavi∆an itself. The grassy saddle between Vošak and Veliki Zavižan offers the first of the Northern Velebit’s great surprises – a heart-stoppingly broad panorama of the Adriatic coast below, with the tawny islands of Krk and Lošinj in full view. Over on the Vošak side of the saddle, the Zavižan meteorological station and mountain hut (open all year round; 053 614 209), which at 1594m is Croatia’s highest, is notorious for its extreme weather reports. Whenever there is a winter cold snap, it is usually Zavižan that posts the lowest temperatures. The station has been manned for the last 38 years by Ante Vukušić, your first point of call if you want any detailed advice on hiking through the park. Perhaps surprisingly for a meteorologist, Vukušić is notoriously cagey when giving out forecasts. ‘Let’s wait and see’ is his usual answer, although he might ask you whether you’ve seen any horses on your way up – if the Velebit’s wild horses are ambling downhill from the mountain-top pastures, it’s a sure sign that bad weather is on the way. Indeed the speed with which the weather changes here is proverbial: rain-bearing clouds can come out of nowhere on the mountain’s upper reaches, and snowfalls may make accessibility difficult or impossible from late October through to Easter or beyond. 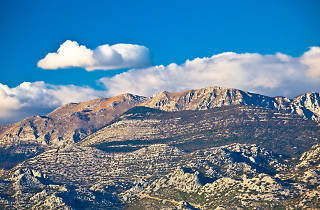 Above all the Velebit is famous for the bura, the fierce wind that blows from the inland plateaus towards the sea. Although it’s at its strongest in winter, the bura can blow up at any time of year. You’ll see trees distorted by these extreme conditions, their branches sprouting from the west-facing side of the trunk but not from the bura-blasted east-facing side. The Zavižan meteorological station is the obvious starting point for the Premužić Trail (Premužićeva staza), a stone-paved path that runs through the heart of the national park, terminating at Baške Ostarije 57km to the south. It’s arguably the Adriatic’s most dramatic hiking itinerary, winding its way from one side of the Northern Velebit’s central ridge to the other. With deciduous forests cloaking the eastern side and prickly Mediterranean scrub covering the slopes to the west, the full variety of Croatia’s diverse highland flora is on display. The trail gets its name from Ante Premužić, the inter-war forestry engineer who saw hiking as a means of boosting regional tourism. Bearing in mind how difficult the Northern Velebit was for the tourists of the 1930s to reach (there was no asphalt road to Zavižan at that time), it was a bold if not to say quixotic undertaking. Local villages were each assigned a stretch of the trail to build, bring much-needed employment to an area blighted by economic emigration. The villages themselves were still quite a distance away from the trail, and materials had to be transported by hand or by horse across difficult terrain. All of which makes it rather remarkable that the trail was completed in three short summer seasons between 1930 and 1933. It’s certainly a beautifully engineered undertaking, gracefully curving its way around Velebit’s brittle limestone peaks, with stone-reinforced embankments bridging potentially awkward bits of up-and-down terrain. The most popular stretch of the trail, and the one that can be easily attempted as part of a day-trip, is the northern end, which starts just south of the Zavižan meteorological station and runs to Rossijeva koliba (Rossi’s Hut), an unmanned mountain refuge 2-3 hours walk away. It’s a truly stunning trek, the scenery changing with every twist and turn of the path, with beech groves alternating with otherworldly boulderscapes, stiff green pines and sudden glimpses of the Adriatic Sea. The grey-brown shapes just offshore provide you with an ideal opportunity to play guess-the-island: is that barren-looking lump of earth Krk? Or maybe Lošinj? Standing at the crossroads where Premužić Trail meets another path heading up from on the coast, Rossijeva koliba is a popular overnight stop for people who want more out of the Velebit than a one-day excursion. Not unlike a traditional Scottish Highland bothy, the koliba itself is a simple stone shelter with a stove and a sleeping platform lurking behind a permanently unlocked door. The Premužić Trail continues southwards towards the national park’s second highest peak, the 1414-metre Veliki Alan (late May to mid Oct; 099 515 4999 mobile), where there’s a 40-bed mountain hut and a downward-leading trail to the bay-hugging village of Jablanac on the Adriatic coast. On the southeastern flanks of Veliki Alan is Mirovo, an abandoned settlement of stone-wall enclosures and ruined cottages. Although the up-and-down-the-mountain patterns of seasonal migration are a thing of the past, there are still sizable communities dwelling in the Northern Velebit’s foothills. The smell of freshly-sawn tree trunks still fills the air at Krasno, a sprawling village on the approach road to Zavižan that serves as centre of the local logging industry. The history of the timber trade is well told in Krasno’s Forestry Museum, where racks of rusting two-man saws provide some insight into what a back-breaking occupation it must have been. Trees felled at the top of the mountain were dragged down the Velebit’s slopes by means of a cable-car whose skeletal remains can still be seen on the coast road south of Senj. Groups of sheep huddle in dry-stone-wall enclosures, providing a clue to the Northern Velebit’s other main money-earner. You can get your hands on the region’s piquant sheep’s cheese by calling in at the Runolist dairy on Krasno’s main street (ring the bell and someone will come and open the shop). Runolist’s cheese has proved so popular that the firm has moved production to a new dairy in big-town Otočac 20km to the east, although the source of the milk – Velebit’s herds and flocks – remains the same. If you rarely see sheep grazing in open countryside in the Velebit foothills then it’s probably because the region is an important habitat for wolves and bears. With an estimated 400 brown bears spread across Croatia’s highland regions, your chances of seeing one in the wild are very slim – although the bear sanctuary in the village of Kuterevo, 7km east of Krasno (Pod crikvom 103, 053 799 222, kuterevo-medvjedi.hr, open Easter-Oct), provides a not-too-be-missed opportunity to observe the creatures at close quarters. Founded in 2002 by Zagreb-based biologist Dr Đuro Huber and largely staffed by international volunteers, the sanctuary provides a home for orphaned or abandoned bears that are too young to fend for themselves. A fenced enclosure near the sanctuary’s entrance houses the youngest, most recent additions to the Kuterevo community. A much larger paddock to the rear provides older bears room in which to roam with a modicum of freedom. Taking the young bears into care saves them from death, but also means that they will grow up without any natural survival skills – meaning that they have to remain in the sanctuary for the rest of their lives. Strict environmentalists may baulk at such a sentimental-softy approach to the world of the Velebit bear, but the sanctuary fulfills an important role in raising public awareness of environmental issues as a whole. Huber himself compares the experience of watching bears in the sanctuary with that of swimming with dolphins – a meditative experience that can help raise eco-consciousness. If the Northern Velebit’s life-enhancing qualities are to be taken at face value, then perhaps bear-gazing at Kuterevo is the best place to start.